African swine fever is an incredibly contagious disease affecting pigs and wild boars. It almost always kills, and quickly: Mortality rates are about 100%, with most pigs dead within 10 days. (It doesn’t affect humans.) Since August, more than 100 outbreaks have been confirmed, in dozens of provinces across China, Mongolia, Vietnam, and Cambodia, ultimately resulting in the culling of a million pigs. For now, the virus shows no sign of stopping. For US farmers, this is extremely bad news. China is the world’s largest soybean importer, and the US its biggest supplier. Much of that crop goes directly to feeding pigs, in the form of pigswill. Fewer pigs eating the swill means less demand for soybeans, depressing prices for US farmers. It will take as much as five years to return pig numbers to their previous point, according to a Bloomberg report, since the number of breeding sows is down about 20% from a year ago, while Chinese pork production is expected to decline by just under a third. American soybean farmers are already under pressure by Trump’s ongoing feud over trade tariffs, which shows no sign of abating any time soon. By the end of last year, thousands of “grain belt” farmers across Kansas, Oklahoma, Texas, Nebraska, and Colorado were forced to apply for a cut of the $12 billion set aside as federal emergency relief (paywall). This allowed for a payment of 82.5 cents a bushel—just under 10% of its market price. 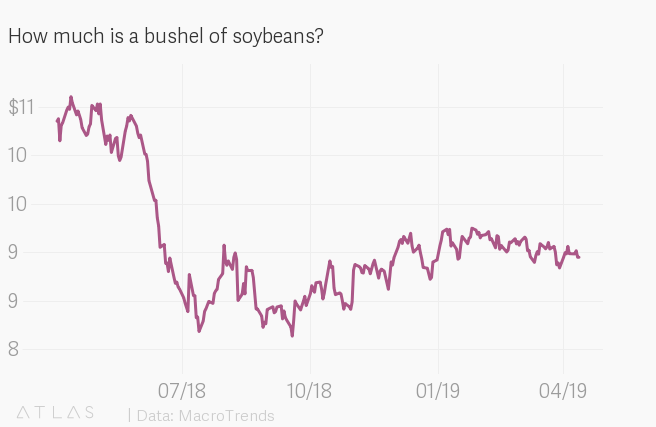 After a sudden tumble in the middle of last year, soybean prices began making a slow recovery. More recently, however, Trump’s failure to resolve ongoing trade talks have stymied its rally. These latest developments are unlikely to revive it—especially as the US backlog of soybeans continues to grow. But there’s a slim silver lining. Pork is the Middle Kingdom’s favorite meat: in 2017, Chinese consumers put away about 88 pounds (40kg) per person. (The already high demand rose in February, around Chinese New Year, in part because 2019 is the year of the pig.) Until local supply gets back to normal, they’ll have to bring it in from elsewhere. The US is an obvious contender, with pork exports expected to increase by 20%. As the US pig population grows, feed budgets will have to adjust to match, providing a much needed bump in demand for American soybeans. Whether it’s enough to make up the shortfall is another story. 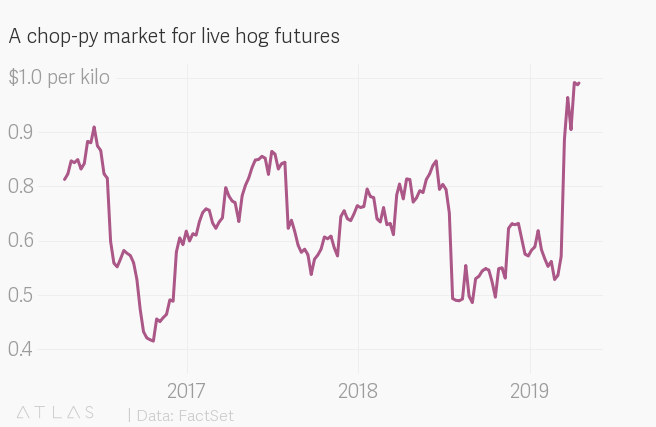 In the meantime, US hog farmers are in the pink: After a rough winter, when hog prices fell to their lowest point since November 2016, China’s misfortune is the US’s gain. Hog farmers are now seeing the highest prices for their piggy commodity since July 2017. As of March, US pork exports to China were up almost three times from a year earlier. That’s assuming they can stave off the very real threat of African swine fever. The disease has never made it to the US in the past, despite being readily transmitted by shoes, clothes, hands, and pork products. To keep it that way, and save any at-risk bacon, the US has banned pork product imports from affected countries, as well as ramping up inspections of passengers and products by humans and specially trained dogs alike.